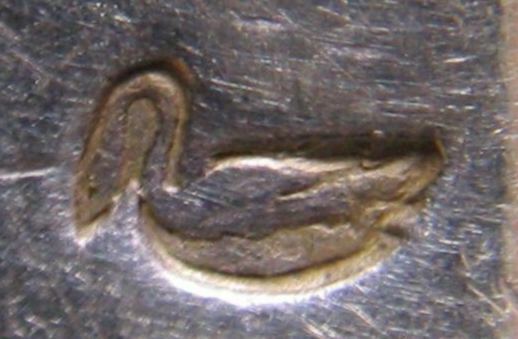 The recent discovery of a silver spoon with the rare mark of the "swimming swan" offers the opportunity to retrace the evolution of the silver hallmarking system in Mantua from the 14th to the 19th century. August 19, 1310 is the date commonly considered as the beginning in Mantua of regulations issued to protect buyers from fraud and to certify the quality of the silver alloy. 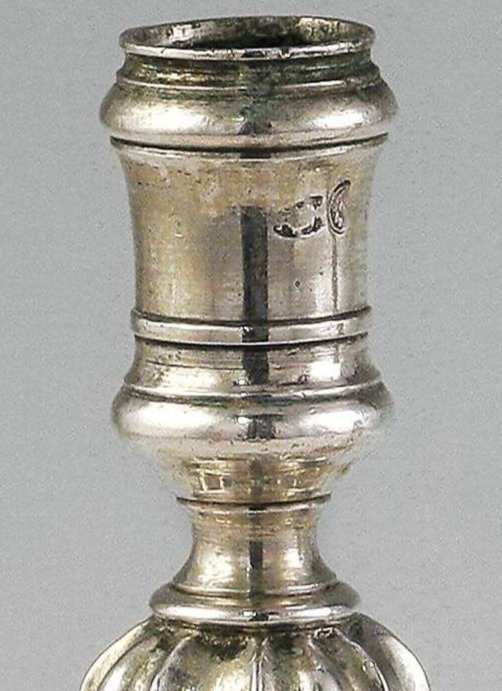 On this date "capitano" Rinaldo Bonacolsi (people's captain) (note 1.b) officially approved the "Statuti dell'Arte degli Orefici" (Silversmiths' statutes). 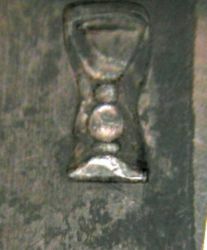 The first warranty mark used in Mantua was "Virgil's head", (note 1.c) the emblem of the "Comune" (Town symbol), of its independent government (Free Commune), and of the town mint that, in addition to coinage, was also responsible for verifying that weights, measures of capacity and lengths conformed to the models kept in the Town hall. 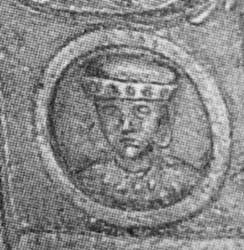 In 1616, following the request of Mantua's silversmiths, Duke Ferdinando Gonzaga authorized the replacement of the Virgil's head with the "Sacred Vessels" image on the warranty silver mark. 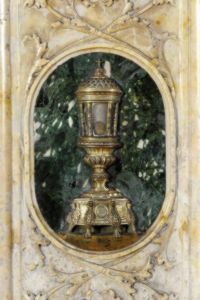 The new mark represented the Reliquary containing the "Precious Blood of Christ", an object of deep religious reverence in Mantua since 1611. This reliquary was alternatively known as "calyx", "vessel" or "pyx". 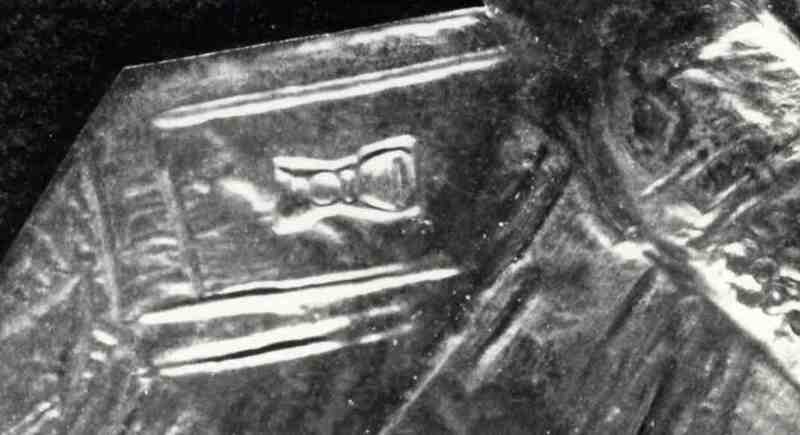 Plain evidence of the shape of the ancient Sacred Vessels is present in Gonzaga's coins and in many decorations of Saint Andrew's Basilica in Mantua, where the Sacred Relic is held. St. Andrew's was for a long time the largest construction site of the town. Its long and troubled history is inextricably linked to the conservation and to the cult of the "Precious Blood of Christ". Built in medieval times, it was rebuilt, starting in 1472, on a design of Leon Battista Alberti, but works proceeded slowly. Well documented are the decorative interventions at the end of the 18th century by the architect Paolo Pozzo (Verona 1741 - Mantua 1803) and the goldsmith and decorator Giovanni Bellavite (Verona 1739 - Mantua 1821). To their collaboration we owe the Main Altar, where the Sacred Vessels are represented on side pilasters. 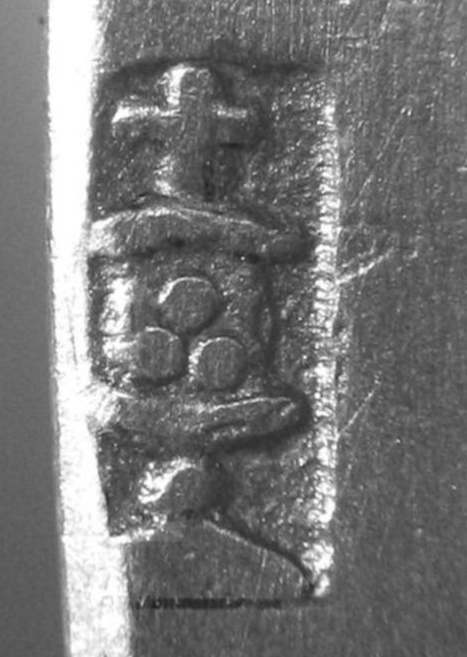 Of particular historical importance is the decree dated April 6, 1621 confirming the mandatory use of two marks to warrant the fineness degree of silver alloys. 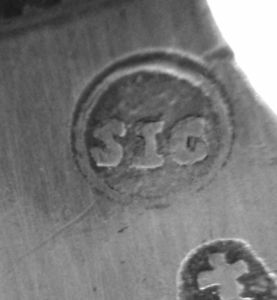 For any object manufactured in precious metal the presence of two marks was required: a silversmith's mark, to identify the workshop and an assay mark, placed by the town mint to certify the quality of the silver alloy. In the second half of the 17th century a new duty was requested by the town mint for assaying metals. The representations of precious metal manufacturers and the following ambitious initiative of silversmith Gasparo Taliani lead to a modification of the hallmarking system. The reduction of the city to six thousand inhabitants and to a little over twenty-four thousand in the countryside bears witness of the extreme brutality of that time. The Duke Charles I Gonzaga-Nevers (1628-1637) demonstrated great intelligence and organizational capacity to promote demographic recovery and to support trade and agricultural activities. The reconstruction work was continued by his successors, especially the Duchess Maria Gonzaga (1637-1647), regent for his son Charles II Gonzaga-Nevers (1647-1665), and then by Charles II itself in the early years of his Government. This brought some hope of new prosperity but was unable to stop the decline which began with the reckless policy of Duke Vincenzo Gonzaga II (1626-1627) and continued to the end of the direct line of the Gonzaga family. To reactivate agriculture and industry and to increase the number of residents, new facilities and privileges were introduced for anyone who would come to live and work in the Duchy. 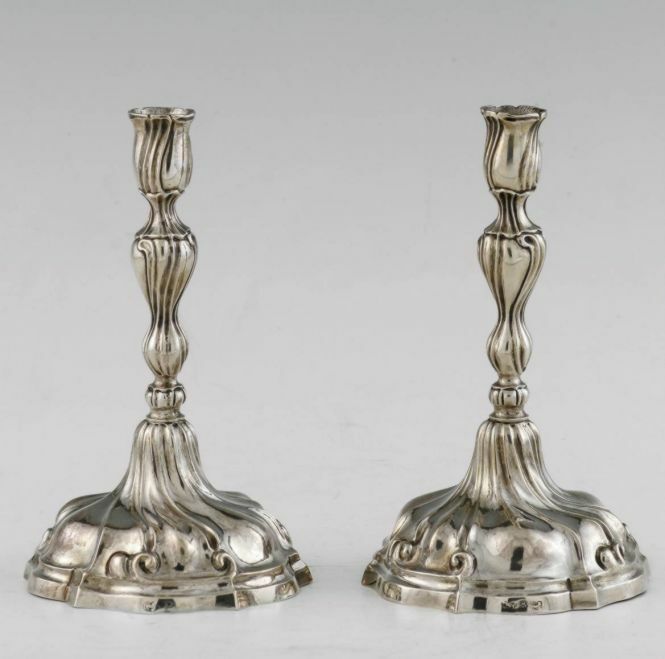 It was certainly these privileges and the favourable economic conditions that attracted and convinced the silversmith Taliani to transfer his family and his activities in Mantua. Gasparo had an enterprising character, sometimes cheeky, and did not fear to play his chances. He had a strong desire to become a citizen of Mantua, notwithstanding the rigid rules necessary to obtain such social promotion, which required rigid economic conditions, high workmanship and recognized moral behaviour. It was necessary to be a permanent resident for several years, to possess real estate properties in the Duchy, and to be engaged in a lawful profession for the decent maintenance of the family. Taliani made a great effort in his attempt to obtain Mantua citizenship and the production of his workshop, where his son Francesco was active also, maintained a high level of workmanship and offered profitable income for his family. 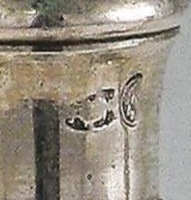 Taliani, like all other silversmiths-goldsmiths of the Duchy of Mantua, had the punch required by hallmarking rules to identify his workshop: the mark was a "crescent moon" with the letters "SIC" in the center ( (note 3). 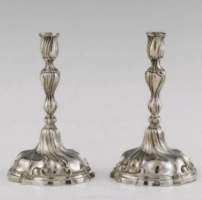 By appointment of the Duke, in 1661 Gasparo Taliani was entrusted with an important and prestigious task: to assay and to warrant silver fineness of the artifacts manufactured by Mantua's silversmiths. 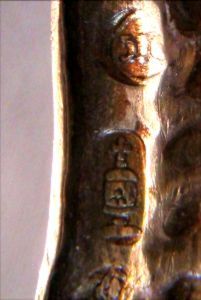 After his nomination to assayer Taliani, to verify the assay, imposed the use of his "SIC" mark instead of the ancient and traditional "Sacred Vessels" mark. This behaviour was considered not fair by his fellow silversmiths as any piece bearing the "SIC" mark could be incorrectly interpreted by customers as manufactured by Taliani's workshop. 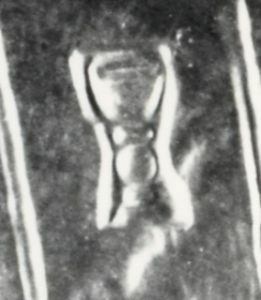 The quarrel was solved by requiring Taliani to use the ancient mark (Sacred Vessel) coupled with his personal "SIC" mark. The use of this pair of marks was maintained and respected for a long time, assuming the function respectively of "town mark" (Sacred vessel) and official fineness warranty (SIC). 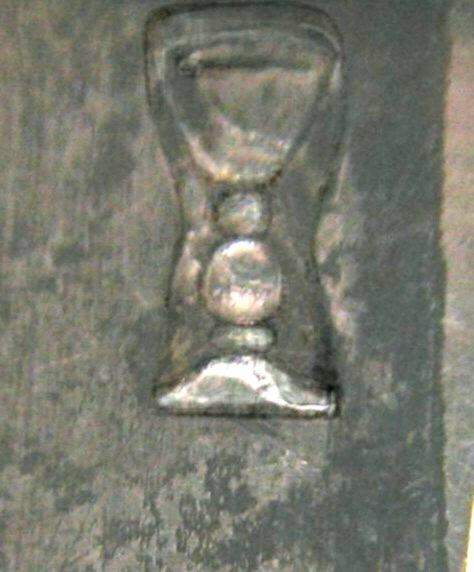 After 1661 Taliani changed his workshop mark to a "cup" and, later, this symbol was used also by his son Francesco and his grandson Gasparo Cristofaro. Unfortunately, few examples of Taliani's production still survive (note 4): melting ancient objects damaged or out of fashion was a common practice. 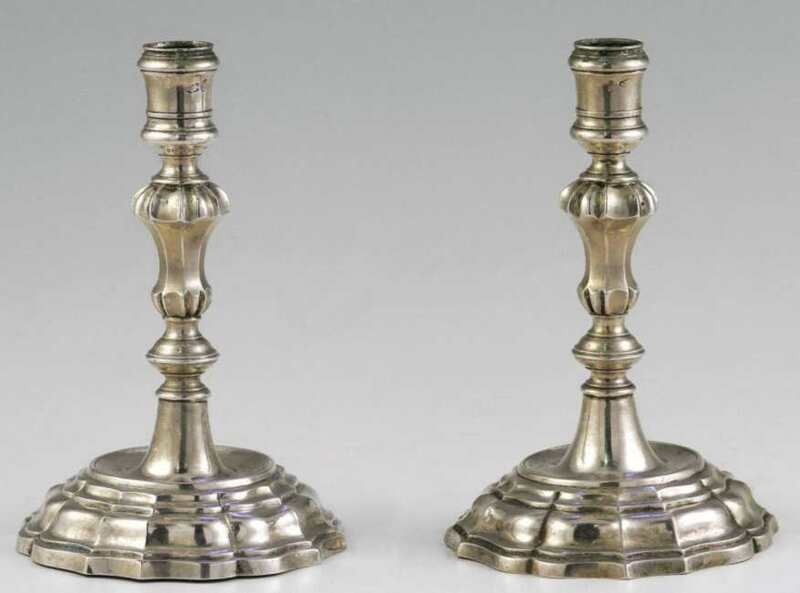 Furthermore, in the last decade of the 18th century three requisitions of silver were imposed by the Austrian Government (1796) and by Napoleon (1797 and 1799) to support the needs of their warring armies (note 1.e). These requisitions deprived Mantua of highly valuable artifacts belonging to their historical and artistic heritage. Descriptions of these masterpieces remain only in archival documents. The addition of the third mark completed the transition to the new hallmarking system. These symbols, albeit with slight variations, would remain in use until the Napoleonic reforms. 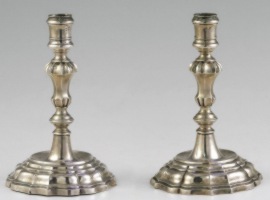 A pair of candlesticks attributed to the workshop of Mantua's silversmith Domenico Strada bearing the "three marks". Similar works were commonly a serial production for general use. They are realized in "barocchetto", a style highly appreciated and widespread in the second half of the 18th century also in France and Germany. 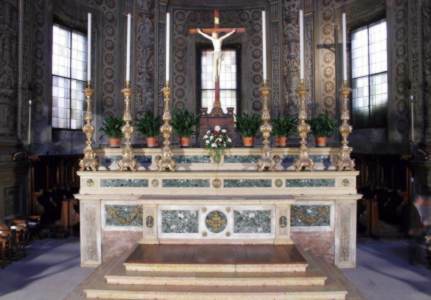 (note 1.a) Mantua (in Italian: M�ntova) is a city in Lombardy, Italy and capital of the province of the same name. The city was founded, probably around 2000 BC, on the banks of the Mincio, on a sort of island which provided natural protection. In the 6th century BC it was an Etruscan village which, in Etruscan tradition, was re-founded by Ocno. The name derives from the Etruscan god Mantus, of Hades. After being conquered by the Cenomani, a Gallic tribe, the city was conquered by the Romans between the first and second Punic wars, confusing its name with Manto, a daughter of Tyresia (Tiresias). The new territory was populated by veteran soldiers of Augustus. Mantua's most famous ancient citizen is the poet Publius Virgilius Maro, Virgil (note 1.c), who was born near the city in 70 BC. After the fall of the Roman Empire, Mantua was invaded in turn by Byzantines, Longobards and Franks. In the 11th century it became a possession of Boniface of Canossa, marquis of Toscana. 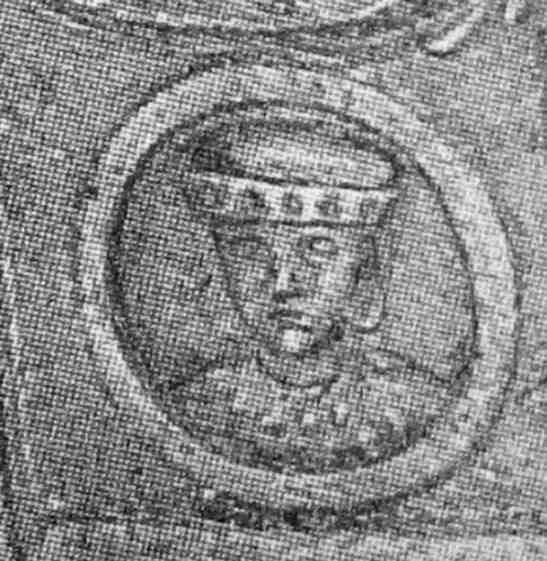 The last ruler of the family was the countess Matilda of Canossa (d. 1115). After the death of Matilde of Canossa, Mantua became a free commune, and strenuously defended itself from the Holy Roman Empire in the 12th and 13th centuries. Between 1215 and 1216 the city was under the podesteria of the Guelph Rambertino Buvalelli. During the struggle between the Guelphs and the Ghibellines, Pinamonte Bonacolsi took advantage of the chaotic situation to seize power in 1273. His family ruled Mantua for the next century, making it more prosperous and artistically beautiful. On August 16, 1328, the last Bonacolsi, Rinaldo (note 1.b), was overthrown in a revolt backed by the House of Gonzaga, a family of officials. 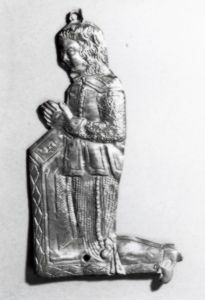 Luigi Gonzaga, who had been podest� of the city in 1318, was elected "People's Captain". The Gonzaga built new walls with five gates and renovated the architecture of the city in the 14th century, but the political situation in the city did not settle until the third Gonzaga, Ludovico I of Gonzaga, eliminated his relatives, seizing power for himself. Through a payment of 120,000 golden florins in 1433, Gianfrancesco I was appointed marquis of Mantua by Emperor Sigismund, whose daughter Barbara of Brandenburg he married. Under Francesco II the famous Renaissance painter Andrea Mantegna worked in Mantua as court painter, producing some of his most outstanding works. The first duke of Mantova was Federico II of Gonzaga, who acquired the title from Emperor Charles V in 1530. In 1627, the direct line of the Gonzaga family came to an end with the vicious and weak Vincenzo II, and the town slowly declined under the new rulers, the Gonzaga-Nevers, a cadet French branch of the family. The War of the Mantuan Succession broke out, and in 1630 an Imperial army of 36,000 Landsknecht mercenaries besieged Mantua, bringing the plague with them (note 1.d). Mantua never recovered from this disaster. Ferdinand Carlo IV, an inept ruler whose only aim was to hold parties and theatrical representations, allied with France in the Spanish Succession War. After the latter's defeat, he took refuge in Venice, carrying with him a thousand pictures. At his death, in 1708, he was declared deposed and his family lost Mantua forever in favour of the Habsburgs of Austria. Under Austrian rule, Mantua enjoyed a revival, and during this period the Royal Academy of Sciences, Letters and Arts, the Scientific Theatre, and numerous Palaces were built. On June 4, 1796, during the Napoleonic Wars, Mantua was besieged by Napoleon as a move against Austria, who joined the First Coalition. Austrian and Russian attempts to break the siege failed, but spread the French thin enough to abandon the siege on 31 July to fight other battles. The siege resumed on August 24. In early February the city surrendered and the region came under French administration (note 1.e). After the brief French rule, Mantua returned to Austria in 1814, becoming one of the Quadrilatero fortress cities in northern Italy. Agitation against Austria culminated in a revolt which lasted from 1851 to 1855, and was finally suppressed by the Austrian army. In 1866, Mantua was incorporated in united Italy by the king of Sardinia. 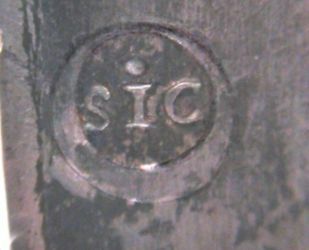 (note 2) At the beginning of the 18th century the mark's outline was modified to oval, while the "crescent" on "SIC" mark was modified to a circle. (note 3) A pennant with "crescent" and "SIC" was adopted in 1595 in by Duke Vincenzo I Gonzaga on the occasion of his military expedition against Turks in Hungary. The original sense of this symbol is unknown. Attempts to solve the mystery were made by I. Typotius on his long and philosophical work Symbola divino et humana pontificum imperatorum regum. Accessit brevi set facilis Isagoge, III, Frankfurt 1642 and by G. Asiani, Istoria del Sangue tratto dal costato di Ges� Cristo per Longino mentre pendeva in croce e per lui portato a Mantova, Mantua 1609. 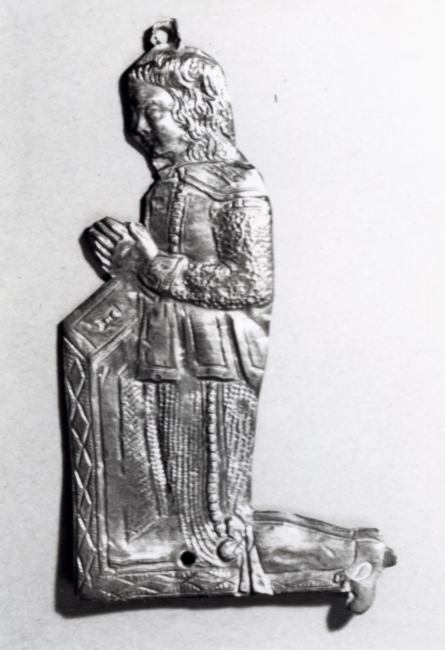 Further interpretations were offered by M. G. Grassi, I medaglioni reliquiario di Vincenzo I Gonzaga, in "Civilt� Mantovana" n. 21, 1988, nota n. 20, pp. 18-21; R. Signorini, Stemmi, imprese e motti gonzagheschi, in Monete e Medaglie di Mantova e dei Gonzaga dal XII al XIX secolo. La collezione della Banca Agricola Mantovana, Milan 1996, pp. 128-129. 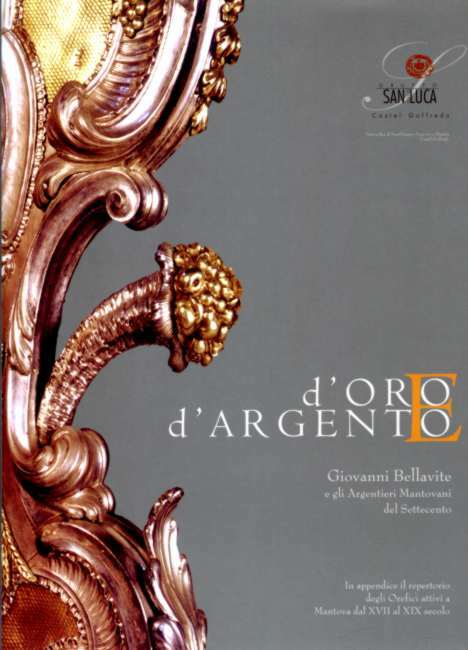 Francesca Rapposelli is the Curator of the book "d'Oro e d'Argento - Giovanni Bellavite e gli Argentieri Mantovani del Settecento" of which Franco Negrini is a co-author.